Post Frame Building Design: Stronger sidewall columns at middle third of building length? 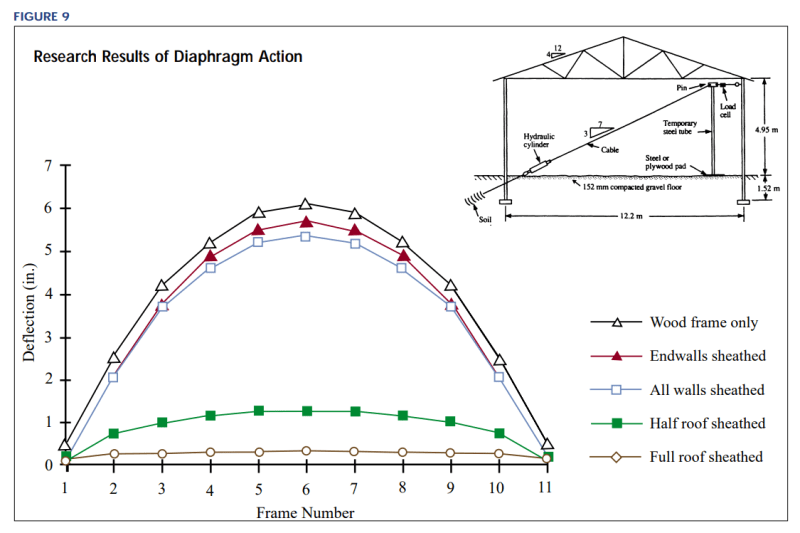 Question for post frame designers: When designing large PF buildings and considering diaphragm action, the greatest diaphragm deflection occurs at the midpoint of the building. That out-of-plane deflection places additional stress on those sidewall columns. Is it appropriate to design 4-ply glulaminated colums at the middle-third of building length, and use 3-ply columns near the end walls? Any input or advice is appreciated. RE: Post Frame Building Design: Stronger sidewall columns at middle third of building length? It would be appropriate for however you feel it is going to react. Personally I agree with your assessment regarding additional stresses on the inner columns due to diaphragm deflection. I'm usually partial to just making all the columns along a wall the same though. For whatever the largest load is, unless a specific (or a couple) column(s) sees a different load, maybe from a mechanical unit bracketed off, or a small mezzanine framing in. When designing large PF buildings and considering diaphragm action, the greatest diaphragm deflection occurs at the midpoint of the building. That... depends. Is your roof sheathed at all? If it is, your mid-building peak diaphragm displacement should be pretty small. Is it appropriate to design 4-ply glulaminated colums at the middle-third of building length, and use 3-ply columns near the end walls? 1) I'd not enjoy explaining to a contractor why the middle third columns are beefier. 2) I'd be surprised if your competition is considering this. We designed "Pole Buildings" considering flexible roof diaphragms specifically so we could use open, un-braced end walls. Each interior and end frame was designed to carry its own loads only. The roofing was 29 gage, screwed to wood purlins with "economy" spacing so little shear strength was likely. It was cheap construction, and it mostly all worked. These were horse barns and such. Thanks for the good responses. Yes, the roof is sheathed with 29 gauge metal, fastened to 2x4 MSR purlins on edge. I should also add that this building is 60'Wx152'Lx16'H, probably the largest building I've designed. The end walls will require plywood stiffening to resist the shear forces. I'm using ASCE minimum design wind loads of 16 psf (walls) and 8 psf (roof). There is a significant unit shear, which results in large deflections due to diaphragm framing bending and shear. I'm going back thru Chapter 6 of the NFBA design manual, and other design guides/resources. In my spreadsheet I had not considered a reduction factor (alpha) for axial force in edge chords (NFBA Table 6-8). Also, for buildings over 100' in length, I require heavy duty X-bracing at the middle roof bay, but do not have solid calculations to show its contribution to resisting diaphragm bending. I'll re-evaluate my design and update later.